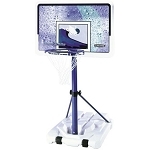 Lifetimes 48 inch clear Acrylic Basketball Backboards feature a pro-glass look and provides superior performance. The steel frame gives added rigidity for improved rebound. The graphics are screen printed with ultraviolet protected inks offering fade resistant color. Wide-span extension arms are engineered to attach directly to the backboard offering the optimum in play and stability. 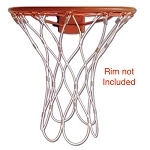 An off set of 24 inches from the pole provides an increased playing area beneath the basket. Play like the pros with the high-performance Slam-It Pro Rim. This rim features an arena style wraparound brace, supporting a 5/8 inch ring of solid steel. Welded steel net hook do not require replacement. Double compression springs provide excellent spring back action. Built for aggressive play. Experience the Power Lift-the ultimate in height adjustment technology! The Power Lift offers instant and effortless height adjustment from 7.5 to 10 feet with infinite increments. To adjust, simply squeeze the handle and the pneumatic mechanism helps to lift or lower the backboard to the desired height. Players of any age or skill can enjoy the game at their level. Lifetimes three-piece 4 inch square pole is excellent for a strong in solid goal support. This In Ground pole is very strong and provides added stability and ensures longevity. It is protected with a weather resistant coating. Cement required for installation. 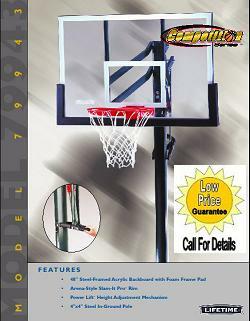 sportsextreme Basketball hoop - Great service, communication, shipping! claryjc4usc Excellent product! I saved big time! highly recommended to all!!! A++++!!!! basketball100 Good product. Smooth transaction. Thank you. dfrenkel Got my hoop, its great. Excellent AAA+. bama920_0 Great item.... Will shop again with seller. 12no24elsinore Great seller! Very satisfied! cweirii Great service & value. Quick delivery as promised. Would buy again! rsheryl I received the product promptly and it looks great! yendortm Shipping well.....But great product great price... Thanks!